At the end of each year comes the month and holiday of Samonios, Samhain or Nos Galan Gaeaf, or Halloween. This is the time when the worlds are drawn together and monsters, gods and the spirits of ancestors wander between them. It is a dangerous and dark time in which the most holy and sacred of ideas mean more than they ever have before in the previous year. It is a time for the Dead and to honor them. Events in the last year were steeped in bloody battles, the death of kings and encroaching evil from the Otherworld. The seers and madmen foretell that the omens are in place to bring a wrathful invasion from the Land of Magic. Most nobles and lords scoff at these superstitious words and ridicule them, but the common-folk know that there is truth in those portents and omens. Families stay close, hold their festivities in honor of their ancestors and the gods, but stay wary of the dangers that might find their way into their darkened homes and lives. But for the young or unwary . . . .
Little Addolgar ap Maelon Gof has wandered into the thick foliage of the Coed Celyddon, lured by the many colored playful lights that he saw dancing and laughing. Now the young dark haired child of ten winters is deep in the mist-shrouded forest soaked in Otherworld energies. A storm is brewing in the dark woods, stirring the trees and causing the limbs and boughs to crack and knock against each other. Owls hoot in their haunting voice and somewhere distant, wolves howl. Addolgar climbs over fallen trees and makes his way in bramble patches trying to get closer to the mysterious lights in the boughs of the trees. Night of Spirits plunges you into the heart of Nos Galan Gaeaf, bringing your characters face to face with the Otherworld and the true horrors of the holiday! 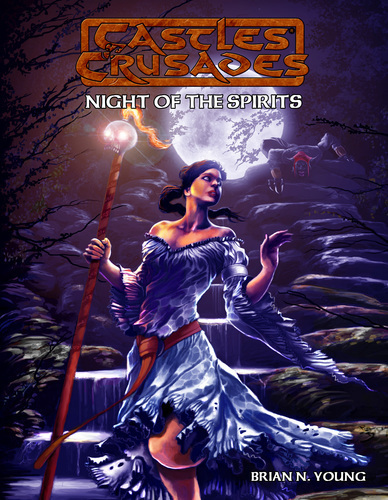 Night of Spirits is an adventure for 3-5 characters of around 4th-6th level.